This was expedition cruising at its finest – plans went out the window and we had a great landing after all, just in a different spot. 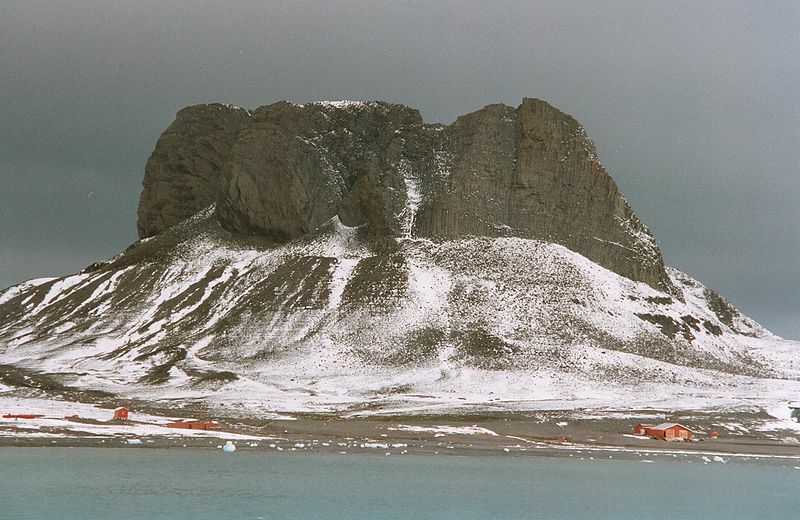 During the night we hoped to relocate down to the Antarctic Peninsula’s northern tip (called the Trinity Peninsula) and enter Antarctic Sound from the west, but pack ice halfway across Bransfield Strait led the captain and Ted to aim back up to the South Shetland Islands and King George Island. Our hoped-for morning landing at Cape Melville was canceled with Zodiacs already in the water, when the scouting staff boat encountered a quickly growing breeze and swell only halfway to the shore. Everyone seemed good-natured about the sudden change of plans and a schedule of lectures was quickly put together for the rest of the morning, including an art lesson with Edward Rooks, a continuation of the popular photo critique with Tom Murphy and Scott Davis, and of course some geology with Ian Dalziel. We found calm but rainy conditions inside Admiralty Bay on King George Island and received permission from the Brazilian Ferraz Station there to come ashore. The rain-wetted cobbled beach stones were beautiful and some krill even washed up, giving us a chance to see the 4cm shrimp-like crustaceans that the humpbacks near the ship’s anchorage were feeding on. Walkers went in both directions along the beach, to the left in search of evidence of the Cenozoic South Shetland volcanic arc, to the right to find the blue whale skeleton assembled by Jacques Cousteau’s team some time in the 1960s. It was half a mile down the beach beyond the base. All the Brazilian base staff were living on an anchored supply ship nearby while the base was being reconstructed after a fire last spring. We were asked not to photograph the base itself, since it’s a sensitive subject, but it was fascinating to walk through and any photojournalist would have loved what we saw. It was interesting to see how a construction project works when staged from ships and in such a remote place. 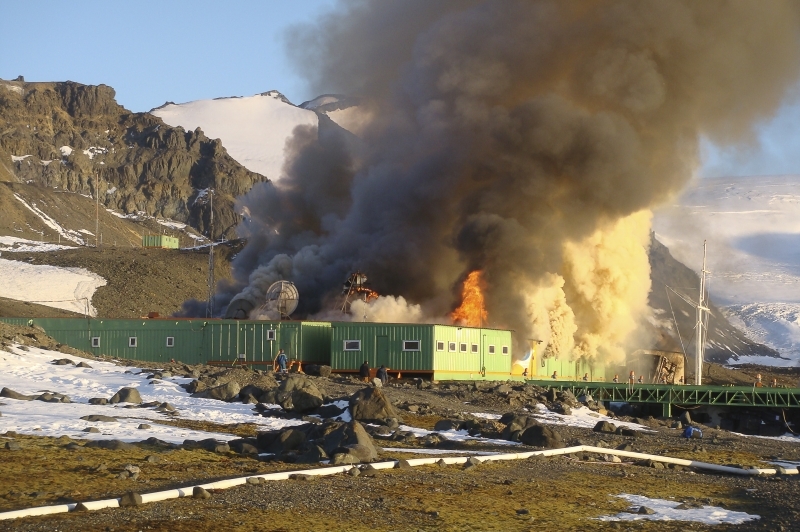 Researchers from Paraná, who conducted research on the Antarctic Continent photographed the moment when the Brazilian station caught fire on 25 February 2012. All manner of mechanical conveyances were parked among shipping containers and partially assembled prefabricated structures. There were bulldozers, Bobcats, treaded vehicles, small landing barges moored to the shore, and two spiffy red and white pilot boats on Antarctic-grade boat trailers, one of which had wheels and one of which had treads. Seeing the wreckage of the old base was sobering, because fire is the greatest danger to these remote outposts. It’s a very dry environment in general, despite today’s rain and the nearby glaciers and seawater. Things burn easily and even if everyone gets out of the buildings, survival in the cold until rescue immediately becomes an issue. Refuge huts and supply depots are strategically positioned outside of bases and in areas frequently visited by researchers. Whichever direction one walked there was no avoiding the numerous large skulls of blue and fin whales strewn on the beach. All were incomplete because the thinner rostrum bones separate from the heavy cranium. They revealed fascinating features such as the auditory bullae and ear canals exposed when the larger bones of the skull separated. One skull was particularly beautiful, with a very dense, porcelain-like texture that develops as whales age and continue laying minerals down in the bone. Not only was it a relatively recent skull, perhaps killed in the 1950s when this bay was last used by whalers, but it was also likely a fairly old whale. The whale skeleton laid out on the low, mossy wave-cut platform was a reasonable reconstruction but high surf had removed many of the ribs, flipper bones, and scapulae. Still, it gave a sense of how big a large fin whale or an average blue whale is, and I gave a brief explanation of how the jaws work and the life history of these animals. While Zodiacs were ferrying passengers back to the ship a young humpback was splashing nearby. There seem to be so many whales here now, yet they are just a tiny (but growing) fraction of the numbers that filled these waters for millenia until only a few decades ago. Any volcanic activity in South Sandwich islands – did you see any other islands apart from King George.